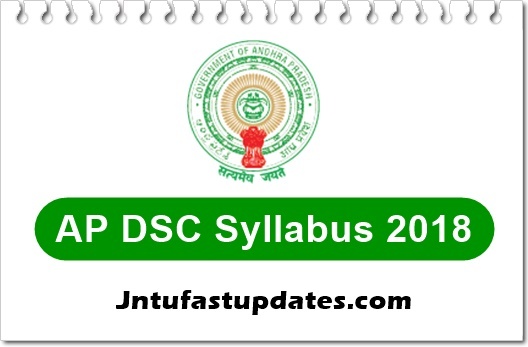 AP DSC Syllabus 2018: Andhra Pradesh Public Service Commission has released the DSC Notification 2018 for 7729 posts of PGT, TGT, SA, SGT, LP, PET, Principal, Crafts, Music, Art & Drawing. For the awareness of the candidates applying for AP DSC posts, here we have given the AP DSC syllabus for all the examinations. Aspirants applying for the concerned posts can check and Download the syllabus pdf to have the knowledge of the examination. This year the AP DSC examinations will be held from 6th December to 2nd January. Still, there is less time left to prepare for the examinations. Hence candidates must prepare well to clear the examination. For the hopefuls competing for DSC examination, here we have collected the AP DSC syllabus 2018. Candidates can download the syllabus from this page and can have the complete awareness of the examination. AP HRD Minister Ganta Srinivasa Rao has released the AP DSC schedule 2018 and announced that the official notification for DSC posts are released on 26th October. Many of the hopefuls seeking to apply for AP DSC posts such as Secondary Grade Teacher (SGT), School Assistant (SA), Physical Education Teachers (PET), Language Pandits (LP), PGT, TGT, Principal etc. Candidates can apply from 1st November to 16th November, as per the schedule details. Hence candidates can get ready with perfect preparation. Having a good awareness of the AP DSC Syllabus and examination pattern will be exceptionally helpful for aspirants appearing the examination. Candidates can focus well on the examination if they have the complete knowledge of the examination. So, go through the AP DSC Syllabus, and exam pattern is given below. The question paper will be in the medium opted by the candidate. NOTE:- Physical Efficiency Test information in Annexure-II. Sir b.ed candidates are eligible for D.sc SGT with out tet qualification..? Sir plz dsc loo music ki syllabus evalaydu plzzzzzz clear gaaa paytandi.